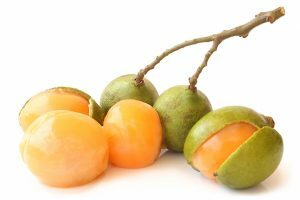 Genip, which has the scientific name Melicoccus bijugatus, is an exotic fruit of the soapberry family that is endemic to south and central America, and also in the Caribbean. It is sometimes referred to as Spanish lime, because of its strong resemblance to the latter, with its soft skin and leathery texture, and their flesh looking like that of a lychee, which is colored orange or yellow and has both sweet and sour flavors. Genip is cultivated in the coasts of Ecuador, the lowlands in central America, the Bahamas, and the West Indies. It usually grows in groups of 12 and in a single stem. Its fruit looks like a big green olive in their shape and size. Genip is also known by other names such as quenepas, mamon, guinep, limoncillo, and skinip. Genip reduces the damages in blood vessels that are caused by harm-causing free radicals, which in turn can cause the heart to put less effort in pumping blood and thus lowering blood pressure and preventing the risks of stroke. Its iron content reduces the risk of anemia, which is a condition that occurs when our iron reserves get depleted, and which has symptoms that include weakness, fatigue, lightheadedness, and stomach upset. Genip has anti-diabetic properties. Because it is low in calories, contains no fat at all, and is high in fiber, it also helps lower cholesterol levels. Genip acts as an anti-oxidant, eradicating free radicals that we get from unhealthy food, metabolic waste, and pollution, from our body. Genip promotes good sleep. It contains the compound trytophan, which is said to induce sleep by stimulating the production of serotonin, which regulates mood levels. clearing the mind of anxiety and worry. It also has properties that calm and relaxes a person, and improves his mood. Genip provides for the maintenance of healthy bones and teeth. Its calcium content is responsible for ensuring that the bones do not get brittle and provides for bone strength and durability, thus protecting the body from osteoporosis. The iron content in genip is responsible for increased red blood cell production. Genip also balances hormone levels in the body. Genip is good for the cardiovascular system. It possesses high amounts of dietary fiber that reduces the amount of low-density lipoprotein or bad cholesterol in the body, which is said to cause atherosclerosis. Genip is good for the digestive system. Its high dietary fiber content prevent constipation by increasing stool mass and absorbing water outside of the colon. It also stimulates peristaltic motion, or the muscular contractions that occur when food is going down the esophagus into the intestines, thus facilitating the digestive process. It also prevents incidents of bloating and cramping. Genip is good for the ocular system. It prevents the onset of vison-related issues such as nyctalopia or night-blindedness, which is a condition that can cause one to have vision problems in relatively low light. Genip is good for the immune system. It protects the body against viral infections such as flu and the common cold. Also, genip’s high vitamin C content induces the production of healthy white blood cells, thereby contributing to strengthening the body’s immunity against diseases. Genip is good for the excretory system. It prevents the formation of urine stones. Genip is good for the respiratory system. It can alleviate symptoms of disorders such as asthma. Genip is usually consumed as it is. It can replace cassava flour as an ingredient for baking. It can be used to prepare beverages, desserts, and jellies. It can also be cooked, like lychee. In Ecuador, genip is taken with salt and chili.When eating genip, you have to be sure that it is fully ripe, because it can be poisonous when it is not so. It also has ornamental purposes, because the tree is said to be a sight to behold. Genip provides for the maintenance of healthy bones and teeth. The iron content in genip is responsible for increased red blood cell production. Genip is good for the cardiovascular, digestive, ocular, immune, excretory, and respiratory systems.